Is there a better alternative to LyricsMenu? Is LyricsMenu really the best app in Internet Utilities category? Will LyricsMenu work good on macOS 10.13.4? Note: LyricsMenu is no longer under development, but can still be downloaded from the link above. 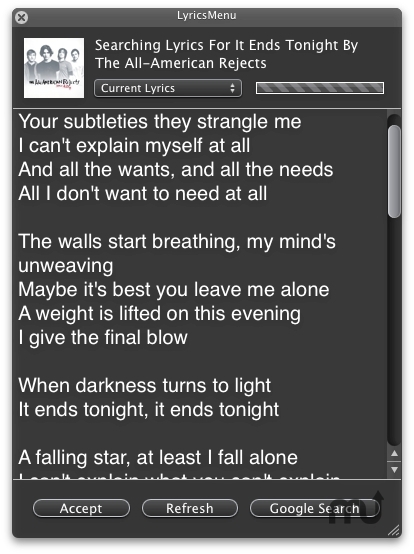 LyricsMenu is the ultimate must-have application for all song lyrics lover. Packed with loads of features and powerful functions, you can't give it a miss. LyricsMenu needs a review. Be the first to review this app and get the discussion started!